Imprisoned Hardwell featured in music video - MTV gets exclusive 24-hour window and worldwide premiere. I wanted to create a song that was just totally unexpected and I’d been drawn to the sound of Kensington for some time. We really vibed well together. It’s got the feel of worlds coming together. GRAMMY® nominated DJ and producer Armin van Buuren releases “Heading Up High” featuring Kensington, the new single from Van Buuren’s full-length studio album, Embrace (Armada Music). The single is out now, accompanied by a music video that is premiered worldwide on MTV for an exclusive 24-hour window. “Heading Up High” is yet the most infectious cut from Embrace and it set the Netherlands on fire when it shot straight to A-rotation at Dutch FM radio. 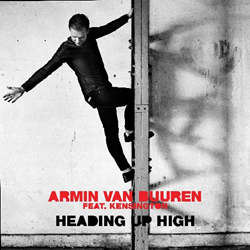 For “Heading Up High,” Van Buuren chose to work with the popular Dutch rock band Kensington in yet another example of Embrace’s musical openness with instrumentation and styles. Kensington’s latest studio album, Rivals (Universal), peaked at the #1 chart position in the Netherlands. The band consists of members: Eloi Youssef (vocals, guitar), Casper Starreveld (guitar, vocals), Jan Haker (bass) and Niles Vandenberg (drums). There is a magical space where electronic dance music meets monster rock ‘n roll and Van Buuren and Kensington were able to find that phenomenal place. The music video for “Heading Up High” depicts a crowd of inmates trying to escape a dome-shaped prison by heading up high through the roof. Among this group of prisoners is Hardwell, trying to soar to freedom alongside his fellow convicts, guided by the inspiring lyrics, rock-solid sounds and sturdy beats of Van Buuren and Kensington. “Heading Up High” is vibrant and dynamic with all the rock ‘n roll charisma that Kensington brings. It’s got a power-ballad pull that grabs the listener while delivering inspirational lyrics. The Dimitri Vegas & Like Mike vs BOOSTEDKIDS Remix is all blistering attack and sonic aggression perfect for today’s EDM audiences. Dimitri Vegas & Like Mike hold the title of DJ Mag’s “#1” in its “Top 100 DJs” poll and the duo give their all to five-time DJ Mag “#1” winner, Armin van Buuren, on their remix. To those remixes, add the Years Remix and the First State Remix – both with achingly melodic arrangements and emotional swells – and it’s no wonder American radio programmers are taking note. “Heading Up High” is sure to be a festival favorite for summer 2016. For more information on Armin van Buuren, U.S.-based media outlets contact EMILY TAN Media Relations, +1(917) 318-3758, EmilyEmilyTan(at)aol(dot)com, and visit http://www.ARMINvanBuuren.com. Follow EMILY TAN Media Relations on Twitter @EmilyEmilyTan.